I’m still doing everything somewhat one-handed but, mostly, the garden is looking after itself. A jar of marrow pickle! You’ll find something from the garden in the store cupboard on the twitter account throughout December and an update every few days on here. I’m particularly fond of witch hazel because it flowers in the winter, has the most unlikely flowers and an intoxicating scent. My Dad bought me the original one for my birthday a few years ago so it has special memories too. Anyway last year it curled up and died so I bought a new one, at some cost and after some searching. When I came home from my holidays last week, it looked a bit droopy so I gave it a good water. This weekend it hadn’t recovered so I guessed the monstrous weevils had been at it. I upturned the pot to find munched roots and dozens of disgusting weevil grubs – I’ll spare you a photo. I’ve given it a good root wash, planted it out in the garden and made an emergency online order for nematodes to see off the nasties. I’m hoping it will recover. In the mean time moving the strawberries from pots into the ground seems to have solved the vine weevil problem for them – this year at least we’ve had an abundant crop and the plants look cheerful enough. It looks like I may have to give up on pots completely, except for herbs and annuals which manage to grow before the nasties get to them. I’ve successfully passed several on to neighbours and family, as well as enjoying eating them in a range of ever-unlikely recipes. Having made emergency plum jam last weekend, marrow chutney is next on the list of things to do. I don’t know what other people do when they come home from holidays after a couple of weeks away – make a cup of tea , open any post, unpack, put a washing on have a large gin? For me it’s straight forward: greet and feed the cat, check that there are no obvious signs of burglary, leaking roofs or other disasters, greet and feed the cat again, water the neglected houseplants, greet and feed the cat again, go into the garden and see what has happened to the vegetables, taking the cat along too. and I knew that the grass would be knee high (tick). I was worried that the tomatoes would overripen or succumb to blight – they’re fine – green and shiny and (crossed fingers) no blight yet. and I certainly hadn’t expected the purple sprouting broccoli (Rudolph, matures December) to be not only mature but actually beginning to flower. So this year’s returning ritual required all of the activities at the start of the post, but also: pick plums, harvest the absolutely mammoth courgettes, the foot long runner beans and the broccoli. Why these? because it should allow a few more to grow. Flowers and baby runner beans, waiting to add to the glut. Why do I want more when I already have too many? – well that’s gardener’s psychology for you. I can’t explain it, it just is. Admire the apples, in waiting to fill the spaces left by the marrows and plums. Do the washing and the housework and the unpacking and the post-opening that should have been done yesterday. Take photos of the above. Blog about it. Holiday return sorted – back to work tomorrow. I’ve been experimenting with these ‘peat free’ planting pod thingies and they seem to have worked really well, especially with tomatoes, peppers etc. You plant one seed (or if you’re a bit nervous, 2 or 3 or 4 as with the basil) in each pod and then plant the whole thing out once they’ve properly established. Seems to work. The other secret, which may explain the parsley, is an electric propagator. I really try to resit anything like this but it’s only one small tray and it seems to make all the difference just to get things up through the soil. Here are the courgettes and marrows. 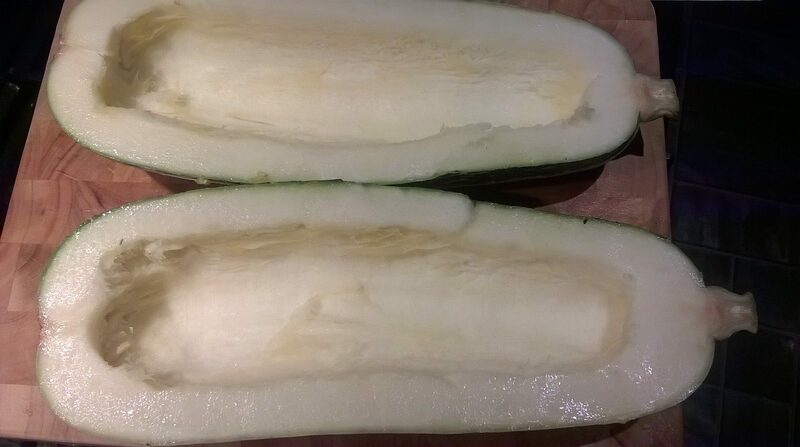 3) Be patient and hope that some more marrows come up? The problem with 1 and 2, of course, is that I will end up with 12 marrow plants which is probably more than even I can cope with – see here for my love of marrows. I took this photo yesterday but the light in the sky was so lovely, it represents the season rather better than the rain and gloom today. The last of a wondrous crop this year. This one had been sitting in the vegetable basket for a couple of months but was delicious in a vegetable curry, despite the long wait. and the beautiful bees, cheering us all as we creep slowly through these dark winter days. 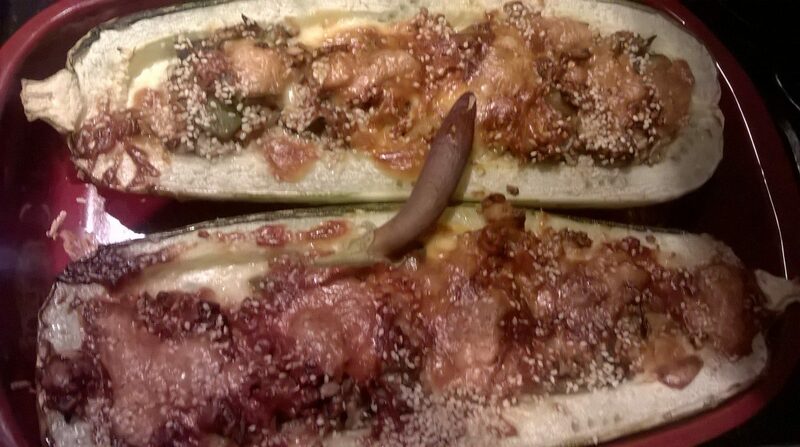 Yes, that is the aubergine and not a slug. It all tasted good. Yet again I am worrying that I haven’t grown enough marrows this year and am convinced again that the cookery writer who snubbed them is wrong.